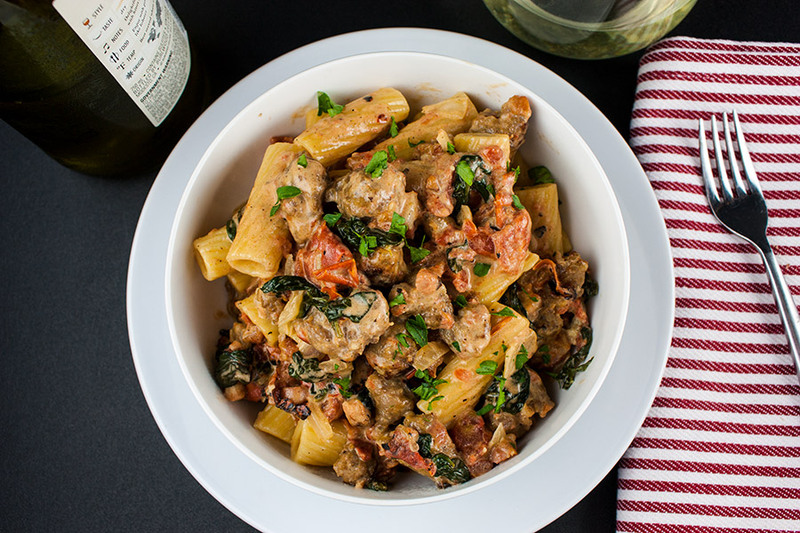 Italian sausage rigatoni with a spicy tomato cream sauce is an easy, hearty, weeknight meal full of flavor and comfort. Control the heat to please your pallet. 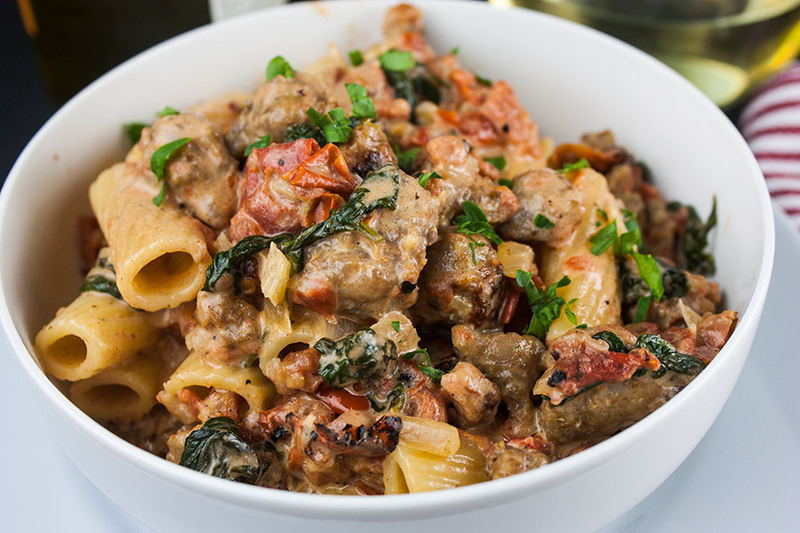 Use spicy Italian sausage if you want to kick the heat up or use sweet to keep it mild. Fire-roasted tomatoes and pancetta add layers of extra soul-warming flavor. Cook the rigatoni according to package instructions. 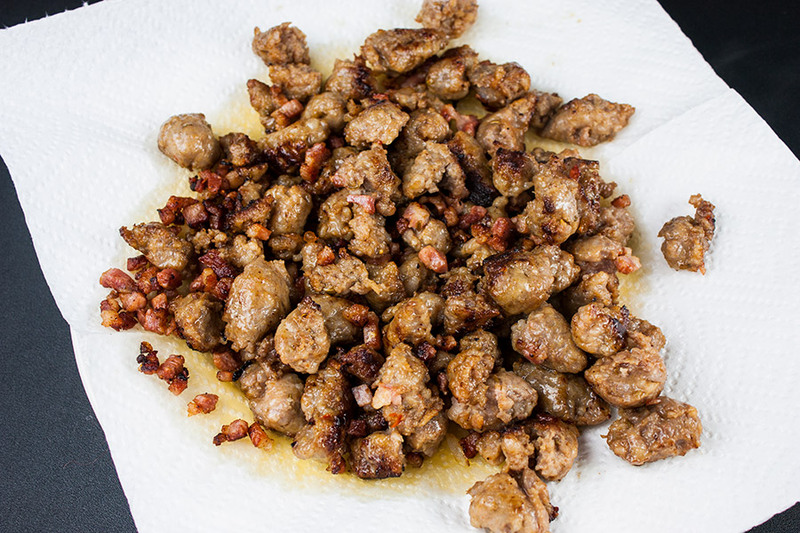 While the pasta is cooking, brown the Italian Sausage and pancetta in a large skillet. Remove to a paper towel-lined plate and set aside. In the same skillet saute the onion until translucent, add the garlic and saute one minute. Add the fire-roasted tomatoes and white wine. Simmer and reduce the liquid to about half. 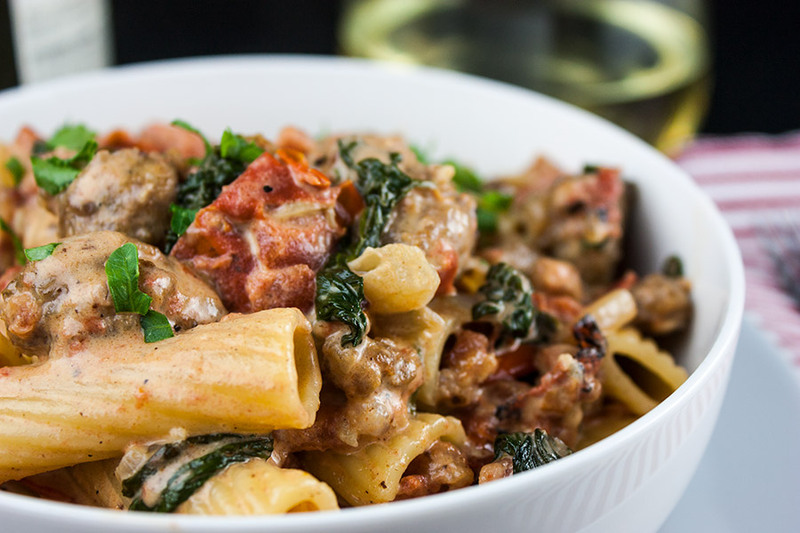 Lower the heat, stir in the cream, spinach, salt, pepper, crushed red peppers, Italian sausage, and pancetta. Cook until the cream is heated through and spinach is wilted. Add the Parmesan and simmer until the sauce has thickened slightly. Drain the pasta, add the sauce to the pasta saucepan (or vice versa), stir to coat the pasta, serve and enjoy! 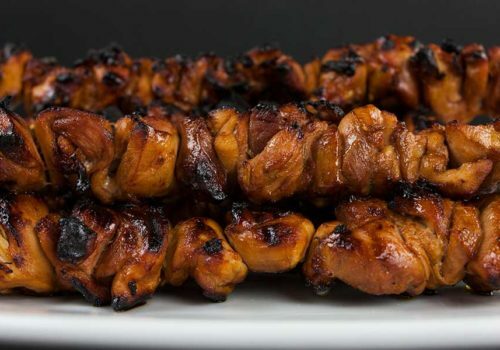 Ugh, I’m drooling as I write this post! Must put this on the menu asap. 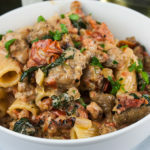 Italian Sausage Rigatoni with Spicy Tomato Cream Sauce - Easy, hearty, delicious pasta dinner to please everyone! Bring a large pot of water to a boil, salt the water. Add the pasta and cook according to package instructions. While the pasta is cooking begin the sauce. In a large sauté pan, heat the olive oil over medium-high heat. Brown the Italian sausage and pancetta. Remove to a paper towel-lined plate, set aside. Add the onion, saute until translucent. Add the garlic and saute another minute. Add the wine and fire-roasted tomatoes, simmer and reduce the liquid by half. 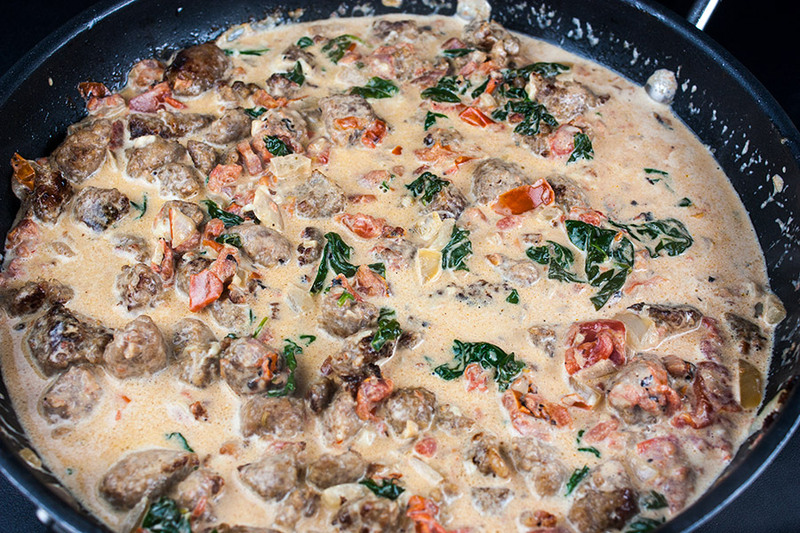 Lower the heat, stir in the cream, spinach, salt, pepper, crushed red peppers, Italian sausage, and pancetta. Simmer until the cream is heated and the spinach is wilted. Add the Parmesan cheese and simmer until the sauce has thickened slightly. Drain the pasta, pour the sauce over and stir to coat evenly. I am planning on making this for my kids when they fly in for Christmas tomorrow! Looks so good! Hey Joann! 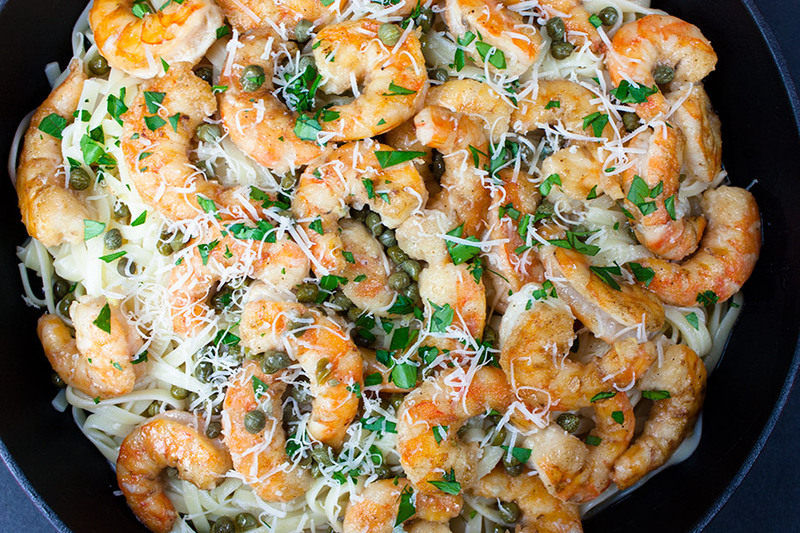 They are gonna love this dish, it’s crazy delish! 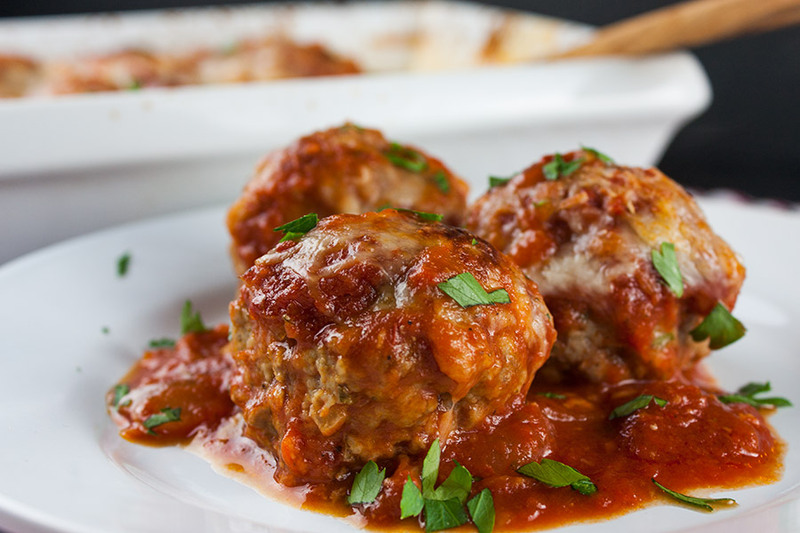 Italian sausage is one of my favorite flavors! This recipe looks and sounds so good. I will be featuring it on this week’s Party in Your PJ’s. Thank you for linking up. Pinned and shared! I love recipes like this. Proper comfort food knocked up in a jiffy. I made this last night and everyone loved it. Really excellent flavors and so simple. Thank you for sharing! I am back to your site to write this recipe down and add to my recipe box. This a compliment as I rarely do this. I made this dish for my children at Christmas, they loved it! I used spicy Italian Sausage and omitted the red pepper flakes. My sister is coming to town and I want to make it for her (mostly, so I can eat it again). Thanks for a tasty recipe! 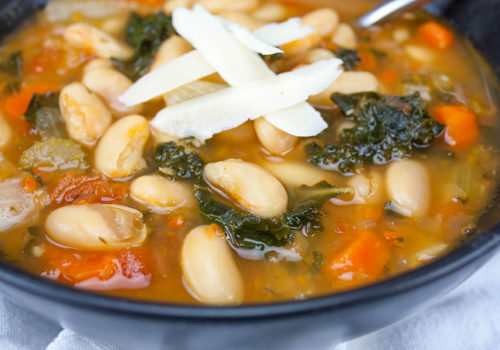 Is there anyway to make this recipe healthier? Looks really good, but very high in salt,carbs,calories. Ed, sometimes you just gotta give in and be decadent. 😉 It’s a pasta dish so you are going to have a lot of carbs. I guess if you just have to make it a little healthier, leave out the pancetta. Sub half and half for the heavy cream, cut out the kosher salt. But I cannot guarantee it’s going to taste as good as the recipe is written. Thanks for dropping by! How do I get your site on my email? Rose, we’re presently between email subscription providers. I have added you to our subscriber list and will receive emails of new recipes once we start sending them out again. Thanks! 🙂 We hope you enjoy it as much as we do!!! Thank you so much for coming by. Made this yesterday, sooo good!! Waiting for my daughter. Have not seen her for 6 months. This is the special dish I made. Looks and smells great. Family and good food. 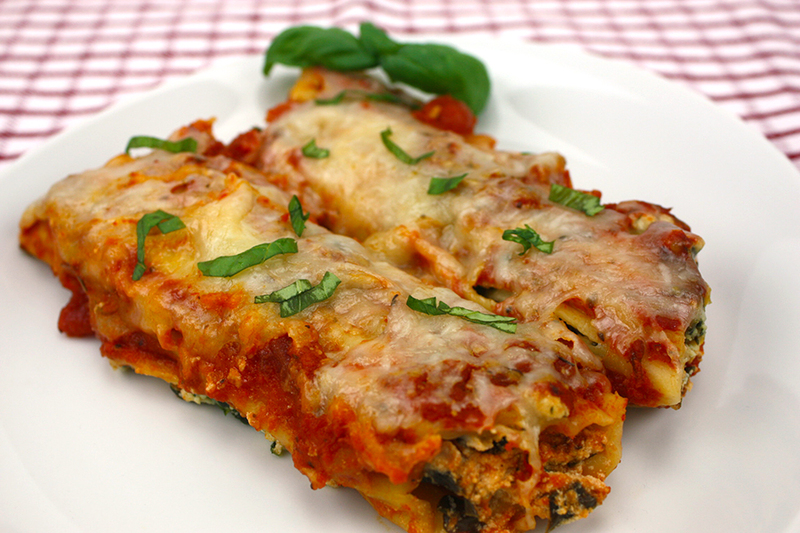 Can you make this ahead of time and reheat it it? 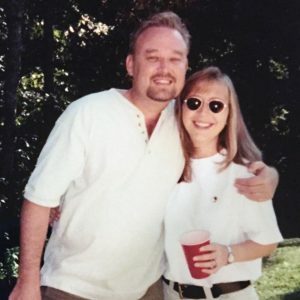 Hi, Melissa. I find that this dish does not reheat very well. Thanks for coming by! Sara, I would use chicken stock.